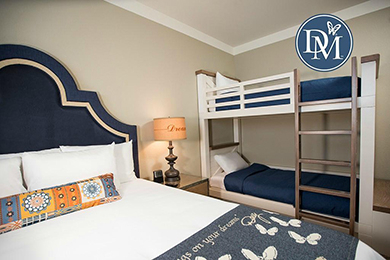 Dollywood’s DreamMore Resort, opened in 2015, is an excellent option for families visiting Dollywood or Pigeon Forge, Gatlinburg and Great Smoky Mountain National Park. The resort is beautifully decorated and includes many of Dolly Parton’s personal artifacts, plus extra amenities. Kids love the outdoor pool area with a splash pad in the summer, and can soak up the indoor heated pool in the winter. Nightly bedtime stories read by staff are an added bonus, as is live musical entertainment in the lobby. For those headed to either Splash Country or Dollywood, families can enjoy the ease of using the shuttle and being dropped off right in front of the theme parks and even purchasing tickets at the hotel to save time. All rooms in the Dollywood DreamMore Resort are beautifully decorated, clean and comfortable. For a standard room, choose either a king bed or double queens. Some king rooms are available with sofa sleepers. 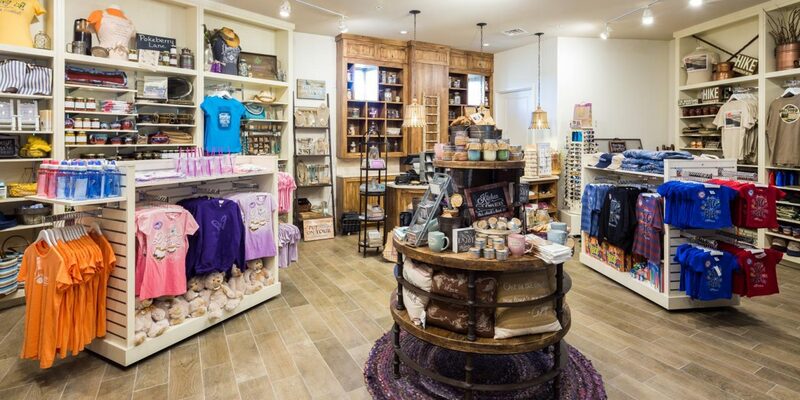 Each floor includes little touches with Dolly Parton's signature items and you will see butterflies incorporated in the decor all around the room. Each room comes with a flat-screen TV, free Wi-Fi, a mini-fridge and a coffeemaker stocked with Starbucks coffee. Bathrooms feature standard bathtubs. Connecting rooms are available. Rollaway beds and cribs are available upon request and free of charge. Standard Rooms with king beds sleep two people, double queens sleep four people and king rooms with sofa beds sleep four people. The Standard Room with Bunk Beds is exactly like the Standard Room, but comes equipped with a king bed and a set of bunk beds. Families love this option because it allows everyone to have their own bed and space while being in one room together. Bunk bed rooms come equipped with a second small TV located across the bunk beds. There is also plenty of room for a crib, which is supplied free of charge when requested. Standard rooms with bunk beds are meant to sleep four people comfortably. Family Suites are very similar to Standard Rooms with Bunk Beds, except the bunk beds have their own enclosed sleeping area separated from the king bed with its own TV. Guests who book on the first floor have the option of a private patio just a few feet away from the outdoor pool area. This room sleeps four people. Junior Suite's are a great option for those looking to sleep a lot of people, but who don't want to be separated. There is no separation in sleeping areas, but families will enjoy being able to spread out a bit. This room sleeps six people. This is a great room for those who may be staying at the hotel with other guests and need a dedicated living area to gather. The Reunion Suite has a king bed in a separate sleeping area with a separate living room that has a sleeper sofa. This room sleeps four. Both areas have their own bathrooms and televisions and all the same amenities that a standard room would have. The Two Bedroom Suite offers two separate bedrooms, one with a king bed and the other with double queens separated by a living room area that also has a sleeper sofa. The bedrooms are closed off from the living room and each room has its own dedicated bathroom and TV for a total of three bathrooms and three televisions. This room sleeps eight. Dolly's Suite is geared toward the die-hard Dolly Parton fan who likes to live in luxury. Dolly's Suite is a penthouse suite with one king bed that sleeps two people and a separate living area, dining area and bedroom. This is the only suite that comes with a kitchenette, a fireplace and a large upscale bathroom with a separate shower and soaking tub. The suite is decorated with personal Dolly Parton artifacts and comes with views from the top-floor of the resort. Bookings for this suite should be made through the resort directly. We had a wonderful experience at Dolly’s Dreammore Resort! We loved the special perks like the trolley over to Dollywood and the Fast Track pass for the most popular rides. This was a perfect time of the year. It wasn’t too crowded and we were blessed with beautiful weather. Cute little bar with a nice menu for food after we closed down the park. Wonderful pool complex. Would love to visit again when the weather was warmer. This is definitely a great place for families with story time and somemores in the evening. This is a review for the Buffet at the DreamMore Resort. This is the best place to eat gluten free in the Sevierville/Pigeon Forge/Gatlinburg area. The on line Buffet menu clearly marks the gluten free items just google "Buffet menu DreamMore," plus I have found that there are additional gluten free desserts available every time that I have gone which are not listed on the buffet on line menu. Non-alcoholic beverages included, Tax or appropriate gratuities not included. The restaurant is downstairs directly beneath the main entrance. I recommend arriving early as the line may become quite long. The DreamMore Resort buffet also has themed events with different chefs and has a half off period usually a week in March. On warmer days, kids adore the outdoor pool and splash area. The main pool features a waterfall and a zero-entry area that makes it easy for little ones to splash around. Adjacent to the pool is a small splash pad with dropping buckets and aerial sprays. Adults love to relax in the hot tub. Lifejackets are available for use and lifeguards are present. The pool reaches 5 feet at its deepest. Pool hours are seasonal. 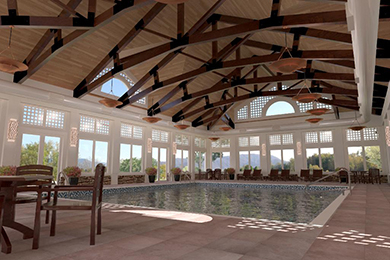 For cooler temperatures, the indoor pool located in the Garden House is a year-round heated pool ranging from depth of 3 to 5 feet. Lifejackets are also available and lifeguards are present. This pool is closed on Sundays and hours vary depending on time of year. The game room is perfect for teens or families who want to spend some time enjoying old school arcade games, air hockey or relaxing in front of one or two large flat-screen TVs playing Xbox. It's a great way to wind down from a long day of sightseeing or playing at Dollywood. For little hotel guests, Camp Dollywood offers a variety of activities and adventures. From arts and crafts to nightly bedtime stories, there are many fun things to do. For kids ages 4 to 10, parents can take a break and relax knowing their children are in good hands. Fees vary depending on activity; for example, arts and crafts require $10 per child. Bedtime story time is free of charge and features books from Dolly Parton's Imagination Library. There is something about the beautiful views of the Smoky Mountains and the crisp night air that make sitting around the fire and roasting S'mores the perfect ending to an already fabulous day. DreamMore Resort offers year-round S'mores (weather permitting) out by one of their many cozy fire pits. S'mores cost $5 for a bag that comes with enough fixings for two S'mores. Whether you are just checking in or cozying up by the fire after a great meal, there will always be some live music playing nearby. Musicians can be found playing local sounds such as blue-grass music, starting most afternoons and evenings in the lobby or on the staircase. The spa and full-service salon offers many amazing treatments that can be taken advantage of by everyone in the family. Some of these treatments include parent and child "Pampered Pair" massages, Bedazzled Butterflies manicures and pedicures for younger guests under 12 years old and Cotton Candy facials for teens. Just like Dolly Parton's roots, Song & Hearth offers down-home comfort food at its finest. The restaurant is open to both guests and non-guests and serves breakfast, lunch and dinner. Adults will love the savory and delicious options such as deep-dish chicken pot pie, bacon-wrapped meatloaf and sweet potato casserole. The kids' menu features pancakes being served all day and two separate menus for little kids and those with bigger appetites that include the typical fare with a few added southern favorites, such as meatloaf and fried chicken drumsticks. The hours of the restaurant are 7 a.m. to 9 p.m., with the lounge open until 10 p.m.
For guests looking for a little more casual and quick fare, the DM Pantry is the perfect place to stop and grab a delicious baked good, salad or sandwich to either enjoy onsite or pack up on the way out. 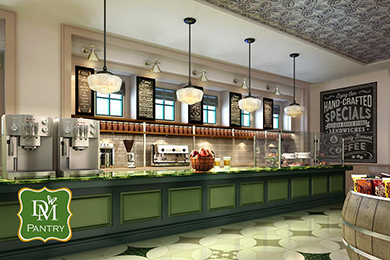 The DM Pantry serves as a quick service delicatessen and bakery, as well as a snack and treat stop. In the morning, there is cold milk and cereal, fruit and yogurt parfaits in the cold section, as well as freshly baked doughnuts and warm cinnamon rolls behind the counter. Starbucks coffee is also served. For lunch, dinner or snacks, there is a multitude of sandwiches, salads, cheese and fruit plates, and cold potato salads in the refrigerator display. The restaurant also has some gourmet ice cream options served in waffle bowls. The hours of DM Pantry are Sunday to Thursday, 7 a.m. to 10 p.m., and Friday to Saturday, 7 a.m. to 11 p.m. Guests of the hotel enjoy many perks at Dollywood and Dollywood Splash Country, including door to door shuttle service to the parks and early entrance on Saturdays. Other great perks include time saver passes for every hotel guest, an exclusive entry to the park designed for guests of the resort, and complimentary package delivery to your room so that when you purchase anything from the park, you don't have to carry it around all day. Peak travel periods make for more expensive rates and crowded attractions so families who are a bit more flexible may enjoy the off-season with cooler weather and better rates. Peak periods for travel in this area is summer and holiday weekends. For those wanting to enjoy the perks from staying at DreamMore at Dollywood, make sure to refer to the park schedule online as hours and openings vary depending upon the season. Most people traveling to Pigeon Forge travel regionally and prefer to bring their own car. But for those who are traveling farther and prefer to fly in and rent a car, the closest airport is Knoxville Tyson Mcghee Regional Airport (airport code TYS), which is located about 45 minutes from Pigeon Forge. DreamMore offers shuttle service to both theme parks Dollywood and Dollywood's Splash Country. This is both convenient and cost-effective, as it costs $20 to park at either theme park. Otherwise, it's recommended to bring or rent a car to get around town if looking to enjoy other attractions such as Smoky Mountain National Park. 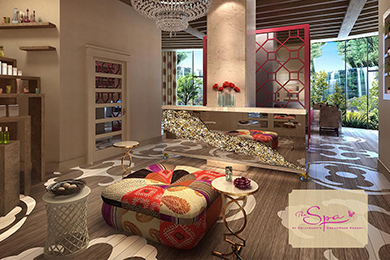 The Spa at the DreamMore Resort is a great way for mom and dad to escape and relax with a massage or get pampered. Services include couples massages, body wraps and facials, as well as full salon services. 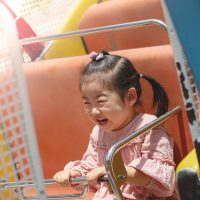 Kids can play at Camp DW while mom and dad enjoy some rest and get rejuvenated. Another great option for an escape is to enjoy a drink and some alone time at the lounge at the onsite restaurant Song & Hearth.